Two rivals from the Atlantic Division of the United States Football League faced off in a First Round Playoff game on June 30, 1984. 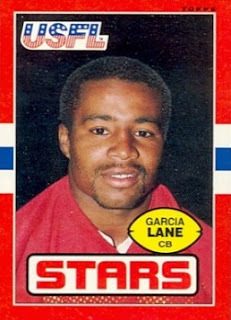 The Philadelphia Stars had gone 16-2 during the regular season, the league’s best record, but both losses were to the New Jersey Generals, the club that finished second in the division with a 14-4 tally. The second meeting had been just the previous week, and Philadelphia had been uncharacteristically sloppy in both contests. The Stars, who narrowly lost the USFL Championship game the previous year, were coached by Jim Mora. QB Chuck Fusina, the league’s most efficient passer, directed the ball-control offense that featured RB Kelvin Bryant (pictured #44 above, with WR Willie Collier) operating behind a solid line. The tough and opportunistic defense that included All-League performers in NT Pete Kugler, LB Sam Mills, CB Garcia Lane, and FS Mike Lush yielded a league-low 12.5 points per game. New Jersey was coached by Walt Michaels and was much improved over the 1983 unit thanks to the addition of significant veteran talent. QB Brian Sipe was one of those upgrades, and while he didn’t have a big season, he was far more effective than the signal callers of the previous year. RB Herschel Walker was again the key to the offense, but he suffered from a sore shoulder all season and looked more tentative, although he still rushed for 1399 yards and 16 TDs while FB Maurice Carthon also reached a thousand yards (1042). The defense benefited from the addition of linebackers Willie Harper, Bobby Leopold, and Jim LeClair, FS Gary Barbaro, and CB Kerry Justin. The game was played before 19,038 fans at Franklin Field of the Univ. of Pennsylvania, once home of the NFL Eagles, due to a conflict with major league baseball’s Phillies for use of Veterans Stadium. The locker rooms were too small to accommodate the teams and they had to suit up at the nearby Hollenbeck Center and walk to the stadium. It had rained during the morning, but stopped prior to kickoff. In the first quarter, a promising ten-play possession for the Generals ended with a pass by Brian Sipe being intercepted by FS Scott Woerner at the Philadelphia 16, and he returned it to his 40. The opening period remained scoreless as the teams traded punts. Early in the second quarter, another turnover by the Generals set up the first score of the game. Pete Kugler sacked Sipe, causing the quarterback to fumble. LB John Bunting recovered and the Stars took just three plays to travel 49 yards. Chuck Fusina connected with WR Scott Fitzkee for 17 yards and FB David Riley for 22, and Kelvin Bryant reached the end zone on a ten-yard sweep. David Trout added the extra point and Philadelphia was ahead by 7-0 three minutes into the period. New Jersey’s next possession ended in a punt and Garcia Lane, sprung thanks to outstanding blocks by DB Bill Hardee and WR Herbert Harris, returned it 70 yards for a TD. Trout again converted to widen the home team’s lead to 14-0. The Generals, down by two touchdowns, were forced out of their game plan, but they advanced into Philadelphia territory on the next series, helped along by a roughing-the-passer penalty on the Stars. However, the visitors came up empty when Roger Ruzek missed on a 42-yard field goal attempt. Bryant immediately took off on a 38-yard jaunt to key an eight-play, 75-yard drive that culminated in Bryant catching an 11-yard touchdown pass over his shoulder in the corner of the end zone. Trout added the point after. The first half ended with Ruzek failing on a field goal try from 49 yards and, despite New Jersey running more plays and generating the most yards, the Stars took a 21-0 lead into halftime. Adding to their problems, the Generals lost three starters to injuries in the hard-hitting first half: Gary Barbaro, Kerry Justin, and G Wayne Harris. The Stars punted following the first possession of the third quarter and New Jersey advanced into scoring territory, but after reaching the Philadelphia 15 following Herschel Walker’s run to convert a fourth down, the Stars stiffened on defense and Ruzek missed a third field goal attempt, hooking to the left from 42 yards. Philadelphia proceeded to put together a 20-play drive that covered 75 yards and ran 11:48 off the clock. Bryant punched over from the one for a touchdown that, with Trout’s PAT, put the Stars up by 28-0 with 10:41 to play and effectively sealed the win. The Generals finally got on the board when Sipe threw to WR Clarence Collins for a 14-yard TD, but it was of no consequence. Philadelphia advanced to the next round by a decisive score of 28-7. New Jersey had the edge in total yards (313 to 269) and first downs (24 to 17), but also suffered the game’s only two turnovers, both of which were turned into points by the Stars. Philadelphia held the Generals to just 70 yards on the ground and recorded three sacks, to one by New Jersey. There were a total of 16 penalties called in the hard-hitting game, with the Stars getting flagged 10 times. Kelvin Bryant rushed for 117 yards on 23 carries that included two touchdowns and scored another on one of his two catches for 32 yards. Chuck Fusina didn’t go to the air often but was typically efficient, completing 9 of 14 passes for 121 yards and a touchdown, including six-of-six for 77 yards in the first half. David Riley and Scott Fitzkee caught three passes apiece, for 39 and 33 yards, respectively. For the Generals, Brian Sipe was successful on 24 of 40 throws for 259 yards and a TD along with one interception. Herschel Walker was limited to 50 yards on 15 rushing attempts but led the club with 6 catches for 79 yards. Clarence Collins contributed 5 receptions for 62 yards and a score and TE Jeff Spek added 58 yards on his 5 catches. “We were a lot more physical today, there was a lot of emotion out there,” said Coach Mora of the Stars. 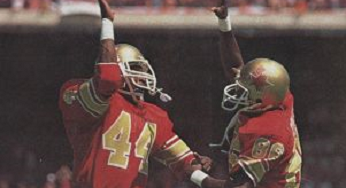 The Stars went on to defeat the Birmingham Stallions the following week for the Eastern Conference title and won the USFL Championship handily over the Arizona Wranglers. New Jersey came back in 1985 to go 11-7 and again qualify for the playoffs, and once more fell to the Stars, now based in Baltimore, in the first round.